If you’ve never heard of Vincent Chin, or if you wonder why this case is of any importance, I encourage you to read the New York Times Op-Ed “Why Vincent Chin Matters” by Frank H. Wu. 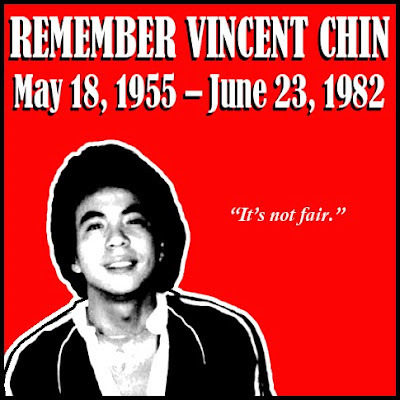 On June 23, 1982, in Detroit, a young man named Vincent Chin died. Four nights earlier, he had been enjoying his bachelor party with friends at a local bar when they were accosted by two white men, who blamed them for the success of Japan’s auto industry. “It’s because of you we’re out of work,” they were said to have shouted, adding a word that can’t be printed here. The men bludgeoned Mr. Chin, 27, with a baseball bat until his head cracked open. The men — a Chrysler plant supervisor named Ronald Ebens and his stepson, Michael Nitz — never denied the acts, but they insisted that the matter was simply a bar brawl that had ended badly for one of the parties. In an agreement with prosecutors, they pleaded to manslaughter (down from second-degree murder) and were sentenced to three years of probation and fined $3,000. It has been a long time since Vincent Chin. His murderer lives a quiet life in Nevada, never having served a day in jail. I would like to think that the days of hate crimes against Asians are long behind us, but that was what I was thinking when Thien Minh Ly, an aspiring diplomat and devout Buddhist was murdered in Southern California. Just two days ago I read about a Vietnamese man in Oregon who’s had bombs thrown at his house. It’s not fair. To learn more about the Vincent Chin case and it’s importance with regard to modern Asian American political activism, check out the film Vincent Who?, produced by a family friend. You can view the trailer below. And please don’t forget Vincent Chin. I really enjoyed reading this by the way. A fascinating look at the life of Chinese-Americans in the last few decades. I remember the movie "Dragon: The Bruce Lee Story" also touching upon that whole "Asians all look alike" bit. Sadly, it happens in Asia too. All white folk are assumed to be English-Speaking Americans when a lot come from other parts of Europe. Cultural exposure seems to be the only real antidote in the long-run. This country is so racist. It's an old American tradition that needs to end.